The main tool we use to help with spiritual growth is what we call “Deeksha” (also known as the Oneness Blessing). Deeksha is an ancient word derived from the Sanskrit language that refers to a “benediction” or a “gift”, or having to do with the notion of “transfer” – in short, the receipt of a gift from the Divine, from God, from the Higher Self, which fuels the awakening process. Deeksha is a Blessing from the Divine that works to activate the kundalini, balance the chakras, and serves to intelligently guide the recipient on an individual, unique journey into higher states of consciousness, and ultimately into the state of Oneness itself. At the Oneness University, participants receive a series of teachings, are taken through personal processes, and learn powerful and ancient forms of prayer and meditation. It is the Deeksha, however, that is necessary to bring these revelations alive in the personal experience of participants. It has been said in many spiritual traditions that it is not possible to awaken merely as a result of one’s own efforts. But rather some form of divine intervention is needed; some form of help is required to take this journey. The Deeksha is simply the Divine reaching out to humanity, offering the assistance that is required for the awakening process to complete itself. In short, Deeksha is the transfer of a physical energy, which affects a neurobiological shift, thereby initiating a process where the Divine guides the recipient on an individual journey into awakening into Oneness. Deeksha creates a shift in the brain, deactivating the energy in certain areas of the brain while increasing energy in others, which results in a diminishing of the feeling we all have of separation. As other areas of the brain are activated, we find ourselves able to truly experience reality, through the senses – to actually taste a banana, to see our spouse for how he or she is, to hear the sound of our child crying. A whole new world opens to us where we are in direct contact with reality, as it is, without being carried away by the never ending chatter of the mind, its evaluations and interpretations. It is an ancient understanding that higher states of consciousness of an awakened being can actually be transferred to another, through a specific initiatory process. We in Oneness utilize this ancient understanding by way of the Deekshas to help you grow and heal. These states are transferred to participants, through the Deekshas, who are able to then have a direct and personal experience of these higher qualities of love, unity, joy, silence, and Oneness. Similarly, the Founders of the Oneness University also meditate with course participants, transferring the Deeksha to help them move into these higher states by awakening their body’s natural energies, the kundalini and chakras. It has been demonstrated in spiritual traditions around the world that being in the presence of another who is living in the reality of Oneness or love or grace is a powerful way to begin to touch these experiences in our own lives in a deeply personal way. The central understanding of Oneness is that inner transformation and awakening into higher states of consciousness is not an outcome of a mere intellectual understanding but through a shift in consciousness whereby one’s experience of life is redefined at its core. This is achieved by the process of the Oneness Deeksha /Oneness Blessing which is a phenomenon sourced in the deep passion and the intent of Sri Amma & Sri Bhagavan. 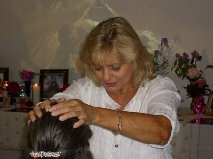 Deeksha is given by laying hands on the recipient’s head or sometimes through intent. In this case, the giver holds the receiver in his or her awareness for a few minutes and allows the Deeksha to flow. In this way, the Deeksha can be given at a distance of thousands of miles or to a large group of people all at the same time. Deeksha unfolds differently in every individual as it depends on what the receiver may need it most.